Auberge de Castille was not still entirely opened for public visitors. This is about to change now. Since these days, you will be able to visit Auberge de Castille basement and much more! There will also be Ambassador’s Suites to be seen. The most interesting area will be probably Office of the Prime Minister. There will be held some historical exhibitions. Do not miss this special opportunity! Starting at 7:30 pm, these days you can see it all. Another great event accompanying this one is going to be march of two Valletta bands – on Castille Square and another musical events in the Auberge garden. 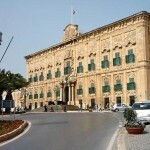 Good, New sections of Castille will be revealed for public | YourMalta.com Blog.